How to Check if Your Website is Penalized by Google and How to Fix it? Blog » SEO » How to Check if Your Website is Penalized by Google and How to Fix it? Are you afraid that your website has been penalized by Google? The main reasons for most websites to get penalized from Google Search is the use of excessive SEO techniques, auto-generated content, and similar actions to game the Google search algorithm. In this post, I am going to tell you what are different kinds of Google penalties, how to spot them and fix them. One bad day, you realize that your entire web traffic has substantially dropped, your entire website no longer appears in Google search results or some of your website’s pages are altogether removed from Google’s search index. That is when your website has stumbled unto “Google Penalty” AKA Spam Action. Note: If you are using WordPress, then you can check out this WordPress SEO guide which will save you from any Google penalty. What is Google penalty (Manual Actions)? A manual spam action is a result of a review by an actual person, from Google webspam team who reviews your website and penalize the entire website or a few or several pages of your website based on the violations of Google’s guidelines. The algorithmic penalty again has several varieties, based on periodic updates from Google. Although, Google Search Console website didn’t provide much information on this matter. 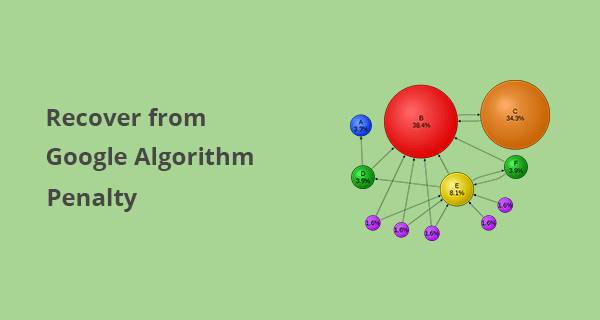 According to Google Search Console Help website, “Google’s algorithms can detect the vast majority of spam and demote its ranking in search results automatically”. The question is what kind of websites considered as spam by Google algorithm? We really don’t know, however, a site using SEO techniques which are against Google’s webmaster guidelines can be a good candidate for auto-spam detection by Google. How to Check if Your Website is Penalized? It is very important to keep track of the latest changes in Google algorithm to avoid penalties. A manual penalty is also a consequence of an occurrence of an algorithmic one. In this case, a notification is forwarded from webspam team to the webmaster about the cause of the penalty. There might also be a ‘Partial manual’ penalty where the reviewer will provide feedback based on problems related to non-functional links and content of your webpage that does not conform to the Google’s guidelines. 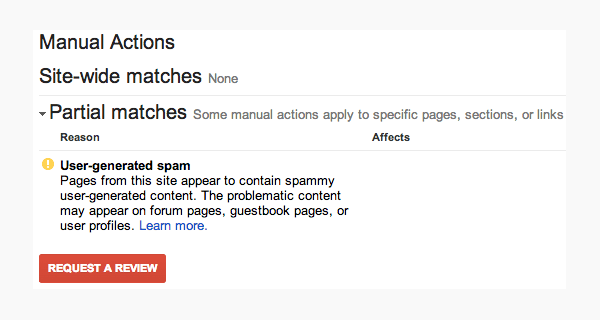 To check for penalties, in this case, you have to log onto the Google Search Console account and select “Manual actions” in the “Search Traffic”. In the worst case, your site may be entirely removed from Google’s index, yet, in the most common situation, it will fall over nominal listings in the Search Engine Results Page (SERP) for several keywords. All webmasters acquire latest and effective SEO strategies to increase the ranking of their site’s search index listing. Therefore, those websites which were below the listing of your website might have considerably improved their ranks by creating backlinks. Since Google consistently and periodically updates the guidelines for websites to adapt to its search engine indexing. There is a pretty good chance Google might have void such backlinks that resulted in higher ranking in recent updates. With each update from Google, the SEO strategies have to be molded accordingly to keep staying up in the search results. So, there is possibly a reason following the recent updates that the analysis criteria might have changed pertaining to on-site and off-site aspects. Once given a manual penalty along with the highlighted problems, you as a webmaster, need to take necessary steps to eliminate the errors and submit a reconsideration request to Google. Your website will be reviewed, and you will be notified whether the penalty has been removed. In case of Google algorithm penalty following a recent ranking algorithm update, you will not receive any notification from Google. There is also no option of reconsideration form as in the case of a manual penalty. In order to identify whether you are hit by an algorithm update is to apply either of the following techniques. The most effective method is to log in to Google analytics and overviews your Google organic traffic. You can do this by selecting your website from Google analytics dashboard and then select ACQUISITION > ALL TRAFFIC > SOURCE > MEDIUM. From the list select GOOGLE > ORGANIC. There you can view the web traffic that you receive via Google search results. Further, select the reporting period from the top right to analyze the potential drop in your web traffic. After correlating the drop with the timeline, you can check with the recent Google algorithm update(s) released during the period to identify which update caused you a penalty. A similar method exists where you can signup and login to monitorbacklinks.com and from the Overview page, you can see the minutes from all the recent Google updates. After reconciling the notes with the time period of the traffic drop, you can identify the cause of the penalty. When hit with an algorithm penalty or a filter (Panda, Penguin etc. ), first conduct a link audit and a forensic SEO to get to the roots of the cause. Backlinks are very important to achieve higher ranking but they can also be the primary reason why your website is penalized. Why Google Penalizes a Website? Over optimizing Anchor Link Text. Using excessive anchor link text that points to your site as a result of closely matching the keywords for ranking. Duplicate content. Copying content is already unethical, let alone a penalty from Google. Make sure the content on your website is original and unique. Here is how to check and fix duplicate content issues. Excessive substandard links. Having too many links from substandard or spam sites can cause you a penalty from Google. Sites having an Open Site Explorer Domain Authority of less than 10 or an Ahrefs Domain Rank of less than 40 are considered low quality. Buzzword content. Content buttered with high keyword density is a candidate for a Google penalty, being a low-quality content. Use of excessive advertising. A cluttered website loaded with advertisement banners and links is negatively assessed by Google algorithm. A website must provide ample space, in pixels on pages in relation to the content. High Bounce Rate. A website or a page may also be penalized for a very reason if a visitor bounces back quickly to the search results without spending an adequate amount of time. Such a page is considered less useful or the content may be irrelevant in regard to the user’s query. Malware. A serious offense where the identity and system of the visitor may be jeopardized if your website is infected with malware or have been hacked altogether. Hidden links. All the links must be clearly visible to the users on your website. In case of any hidden link, it can be considered suspicious. Let me know your thoughts in the comments below. If you don’t have any idea how to recover from Google penalty, you can always get in touch through comments or by contact page. I have checked a number of tools but found most of them inaccurate.